Taking it one step further than with other gauntlets, the Ansell Solvex 37-900 Red Nitrile Chemical-Resistant Gauntlets have been individually subjected to leakproof tests and checked for defects, therefore guaranteeing quality. A newly developed nitrile film offers outstanding strength and chemical resistance, while their durable but flexible nature makes them a highly useful gauntlet that can be trusted to deliver an excellent and safe performance. 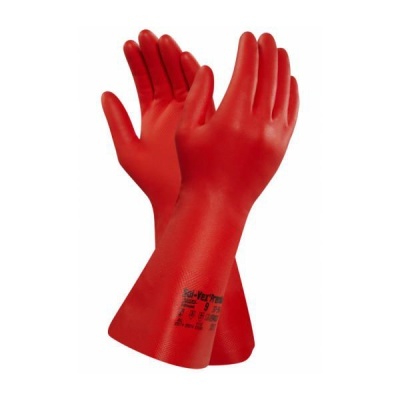 The Solvex 37-900 Red Nitrile Gauntlets are available in five sizes that should suit the hands of most users. Please measure the circumference of your hand around the knuckles (excluding the thumb) with your hand open and your fingers together, and the length of your hand from the tip of your middle finger to your wrist.